Syracuse Chiefs Lost, 10-9 @ Gwinnett, 7:05 p.m. Ross Detwiler (5-6, 5.01) vs.
Auburn Doubledays Won, 6-4 @ State College, 7:05 p.m. Kelvin Lopez (0-0, -.–) vs.
DSL Nationals OFF DAY vs. DSL Mets1, 10:30 a.m. Gilberto Mendez (1-0, 3.46) vs. This game featured 19 runs, 32 hits, 2 Syracuse blown saves, another heartbreaking loss to the Charlotte Knights, and an out-of-breath recapper. After Saturday night’s walkoff victory, Sunday afternoon Syracuse failed to tie the game up after loading the bases in the 9th inning. A poor performance starts with lackluster starting pitching, and Yunesky Maya appears to not be fooling anyone right now. After a leadoff double by Jordan Danks and a Michael Restovich walk in the sixth inning, Ryan Tatusko was brought in to add more gasoline to the fire, allowing both of Maya’s runners to score and two more of his own to score while putting Syracuse down 8-7. Syracuse got both perpetrators off the hook with a two-run 7th. Tug Hulett doubled in Jim Gallagher who had doubled and Chris Marrero (0-4, R, BB) who had walked earlier in the inning to put the Chiefs up 9-8. Charlotte, however, provided the dads in the house with an immediate response when Gookie (how do you get named Gookie?!?! [Ed. Note: It refers to a face made famous by Harpo Marx]) Dawkins hit a two-run homer in the bottom of the 7th off Jeff Mandel to end the scoring and leave Syracuse on the wrong end of a wild 10-9 loss. Lost in the wild scoring at the end were Corey Brown’s two home runs and 3 early RBI to put the Chiefs up early 3-0 before Maya’s Meltdown. Erik Arnesen did everything he possibly could to carry a feeble Harrisburg offense to victory. He offered a quality six innings. He got a hit. Ultimately, the Harrisburg defense hurt his outing by contributing to an unearned run and the feeble offense couldn’t make up for it. The Suns only mustered one unearned run themselves when Jonothan Tucker reached on a throwing error by catcher Tony Sanchez, Josh Johnson doubled, and Archie Gilbert grounded out. Harrisburg’s chief nemesis was Quincy Latimore, who went 2-2 with a double, a homer, and two of Altoona’s run scored. Relievers Corey VanAllen and Jimmy Barthmaier failed to add quality relief; they allowed one run each. The link above is the official press release regarding the cancellation. 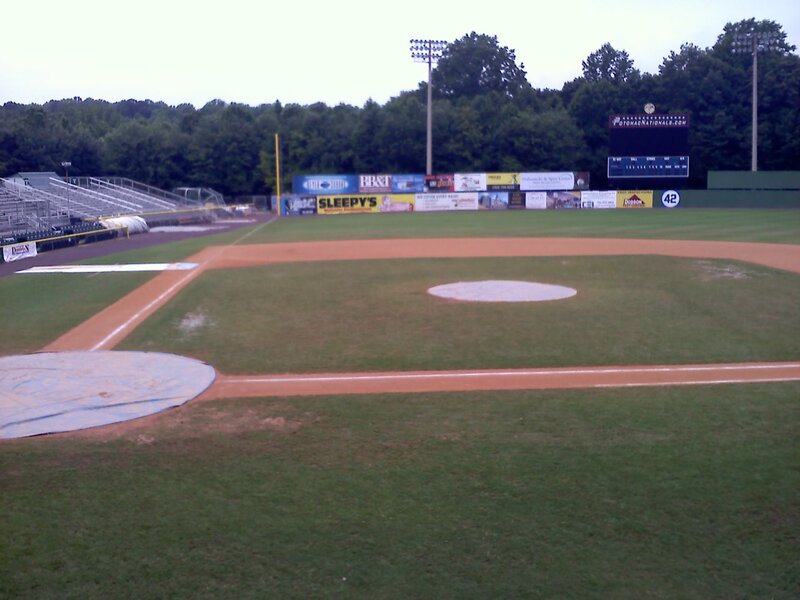 This is how the field looked like at approximately 1:10 p.m. yesterday afternoon: Pic1 | Pic2. The second half resumes on Thursday with a six-game trip from South to North Carolina, with visits to Myrtle Beach and Kinston for three games each. After being mathematically eliminated on Saturday night, the Hagerstown Suns closed out the first half with a big 11-4 win, its third straight following a six-game tailspin that killed their playoff hopes. The Suns pounded out 19 hits, with every batter collecting at least one and four collecting three. Kevin Keyes and Wade Moore both homered. Bryce Harper sat for the second straight game, ostensibly to rest his nagging injuries. Sammy Solis pitched the first four innings while four relievers followed him out of the ‘pen, including Chad Gaudin on rehab. Christopher Manno’s struggles returned with his worst outing of the season: two runs on three hits and walk over just one inning. Russell Moldenhauer’s two-run double capped off a four-run second, as the Auburn Doubledays held on for a 6-4 win and took the series 2-1. Pedro Encarnacion couldn’t go the requisite five to get the win, chased with two outs in the fourth inning with three runs allowed on three hits and four walks. Aaron Barrett got the win despite also giving up four walks and a run in just two and 2/3rds innings. Travis Henke and Ben Grisz closed out the game with two and 2/3rds scoreless innings to get the hold and save respectively. Angel Montilla and Moldenhauer paced the 12-hit attack that saw eight of the nine batters reach base safely. The initial roster has a strong Dominican feel to it with roughly a dozen-plus DSL “grads” making it stateside (yes, including HWMNBN) for Opening Day in Viera. Some notables: 17-y.o. IFA Pedro Severino (C), 18-y.o. IFA Arialdi Peguero (1B), Nathan Karns (RHP), Luis Atilano (rehab), Francisco Soriano (rehab), and our 2011 Watchlisters — OF Victor Chavez, RHPs Anthony Marcelino and Andy Santana, IF Jean Carlos Valdez. Some home cooking this week for the D-Nats with just one road game over the next six (@ D-Giants) as they host the D-Mets1, D-Phillies, D-Rangers, D-Cubs2 and the D-Marlins. It’s time to put the Potomac blame where it deserves to go, with a General Manager who spends every game perched in his office paying attention to nothing. No tarp on the field, no effort to make mandated improvements to the stadium. You can rely on him for two things: he will come sell his cookies for one inning (no joke), and he will spend the rest of his time sequestered in his office. Previous Potomac GMs were visible, involved in stadium operations, and weren’t afraid to get their hands dirty. Not this former salesman from an independent league team. And posting a game cancellation on the website at 1215 when the gates open at 12? Let’s not forget the field was already condemned this year, and “repaired” with a drainage system that obviously does not work. 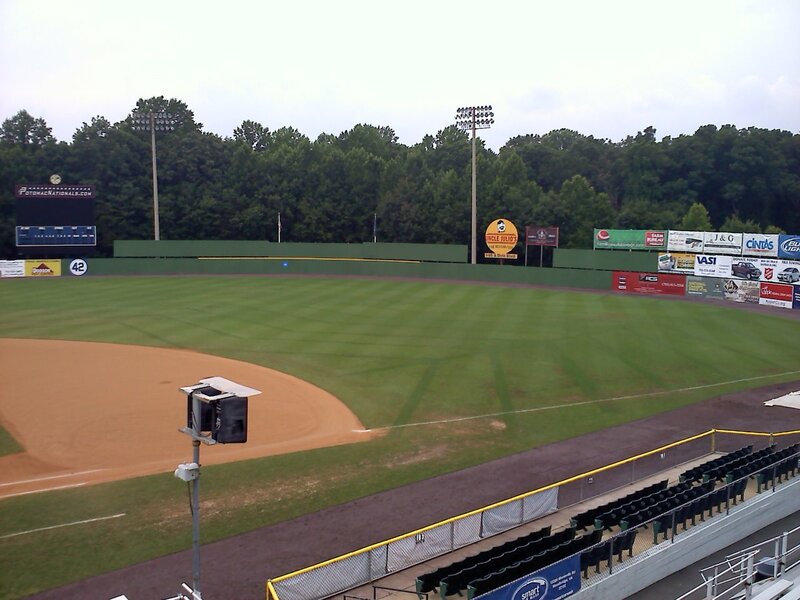 A minor league GM does not have player personnel functions; he is supposed to keep the stadium running. And this one has run it into the ground – no, make that the swamp. Quite frankly, I don’t care who’s to blame, I just want the field fixed so we can have games played. That said, I have sent off a message to the local newspaper, reminding them that this is a story worth looking into. Let’s see what happens. Sue_D: Those gametime photos look like the field was in ok condition – Headed to the Phitz yesterday & talked to folks in the ticket office for a few minutes (apparently about the same time you were there). Apparently the call was made earlier in the morning after they rolled off the infield tarp & saw some pooling in the outfield. and I also can not imagine that Nats brass allows Harper to play there. My guess is he stays in hagerstown a few more weeks. Nice to see baseball heads like you dropping by. What was it like pitching in the minors? FYI – Tom Milone is John Sickels’ prospect of the day. Have to figure he is Jason Marquis’s replacement at some point in July. Although Boz still thinks its Detwiler. I think its going to be Milone. According to Bowden’s blog planning for a trade takes about six weeks so have to assume they’ve already started laying the ground work for a trade or trades to occur in July. Planning for a trade? Jim Bowden? Not sure he’s the most credible source. Elliott: I’d hope most of us reading this blog understand that it’s high-school ball (inter-city or county bus rides for a day) taken to an extreme (4 to 14 hour bus trips every 3-4 days as a normal occurance). The minors are both dirty and hard on players, with very few benefits, but it’s what paves the road to the “big show”. That’s why we appreciate those who come through the gauntlet even more. All you need to know is that Detwiler pitched a gem again, 3 hit, 2 run, 4 walk baseball. It would have been 1 run if Lee Hyde could actually pitch, but he walked a guy and then gave up a single to tie up the game. If ‘Cuse loses it will go down on Hyde, the AAA Dougie Slaten. And as of now, Pena is pitching. Make your own assumptions on how this could turn out. What is wrong with Pena? He has looked horrible at Syracuse and this recent outing might have just been his worst. Is he just not ready for AAA or does he lack something that has caused him to fail in the transition? Boston with a 10 run 7th? Why can’t we do that at any level? I hate the Red Sox!! !